The US dollar has been in bullish formation for the past three months, as displayed in the chart below. 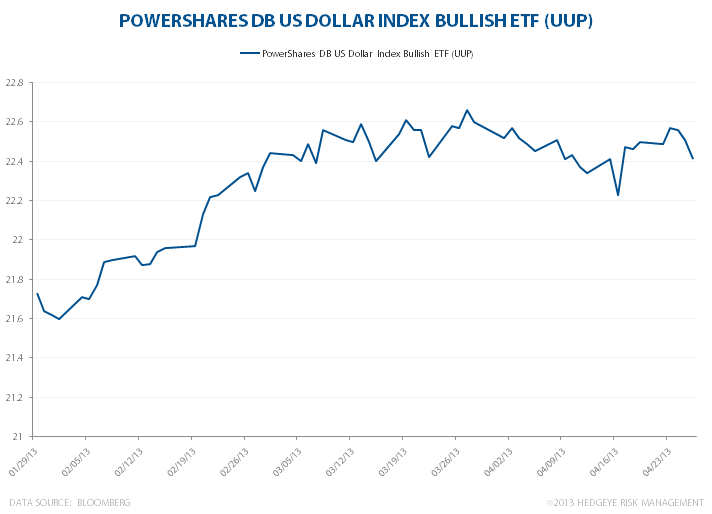 The PowerShares DB US Dollar Index Bullish ETF (UUP) is up +2.8% over the last three months due to significant appreciation in the value of the dollar. In turn, commodities have taken a hit across the board, which has become quite evident in gold, oil and agricultural commodities like corn. The strong dollar is a catalyst for a stronger America. A boost in consumption will help drive economic growth in the United States and that's accomplished through lower gas prices and cheaper groceries. The dollar might be down today but it will continue to rise over the coming months and that's something investors and consumers can get excited about.